24 - Edinburgh - Archibald Constable and Co., 1819 Book. Very Good. Hardcover. First edition.. A selection of works by Sir Walter Scott. Comprising of the following:St Ronan's Well, three volumes, first edition (1824) with half-titles as called for. The Fortunes of Nigel, Second Edition, same year as first (1822) with publisher's adverts to the rear of volume II and III. Kenilworth, Second Edition,Same Year as First (1821) with half-titlesas called for. Tales of My Landlord, Third Series, Collected and Arranged by Jebediah Cleishbotham, Third Edition, year as first (1819) with half titles as called for. Sir Walter Scott was a Scottish historical novelist, playwright and poet. The majority of novels by Scott are known as the Waverley Novels, with the Tales from My Landlord series being a subset of these novels. 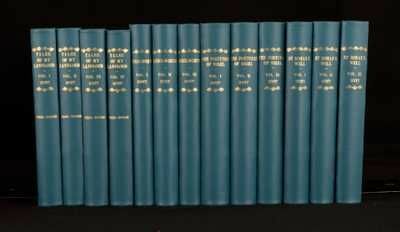 These works are uniformly bound inblue buckram. The Waverley Novels were among the most popular and widely read novels in all of Europe for almost a century. Condition: In full cloth bindings with gilt stamping to spines. Rebound, to be a uniform set. Externally, excellent with minor shelfwear. Internally, all volumes are firmly bound. Small ink spill to the first leaf of volume III of St Ronan's Well. Does not affect text. Small light tidemarks from potential ink spill to the top of page 275, to volume III of Fortunes of Nigel, not affecting text. Chipping to publisher's ads at the rear of volume III of Kenilworth. Pages to all volumes are untrimmed. All volumes have pages that are generally bright. Spots to the first and last few pages and the odd spots throughout. All three Tales of My Landlord volumeshavemorespotting than the rest. Overall: VERY GOOD..